NETWORK UPDATE: FOX’s regional MAJOR LEAGUE BASEBALL coverage lost 0.1 to 0.6 in final numbers. CABLE HIGHLIGHTS: NBC Sports Net’s NASCAR coverage took the night at 0.63, beating the last evening of SHARK WEEK on Discovery. The latter earned 0.58 for the first run of SHARK TREK, 0.56 for SHARKSANITY: THE RETURN and 0.46 for ALIEN SHARKS. (Note: the chart is still affected by Discovery’s listing of the re-airings of these specials as originals.) POWER returned to Starz after taking off July 4th, up a hundredth to 0.56. 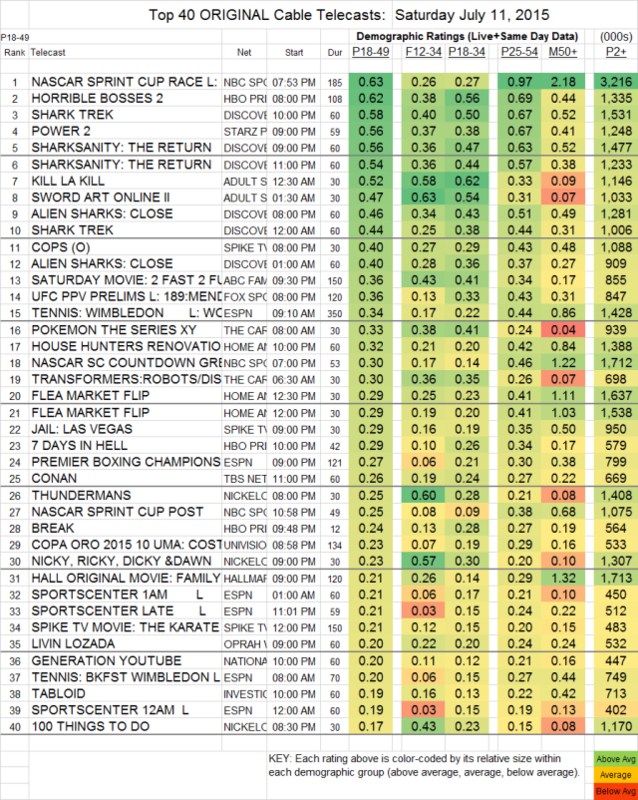 Adult Swim’s late-night block returned as well, with KILL LA KILL up 0.06 to 0.52 and SWORD ART ONLINE up 0.13 to 0.47. COPS (Spike) was down 0.03 to 0.40. On the tennis front, ESPN’s morning coverage of the WIMBLEDON ladies’ final was at 0.34, while HBO’s 7 DAYS IN HELL comedy was at a mild 0.29. BBCAmerica inhabited the nether regions of the chart, with ATLANTIS down 0.03 to 0.04 with 189K total viewers, and JONATHAN STRANGE AND MR. NORELL down 0.02 to 0.03, with 165K total viewers. BIG BROTHER AFTER DARK (POP) was at 0.04/112K.